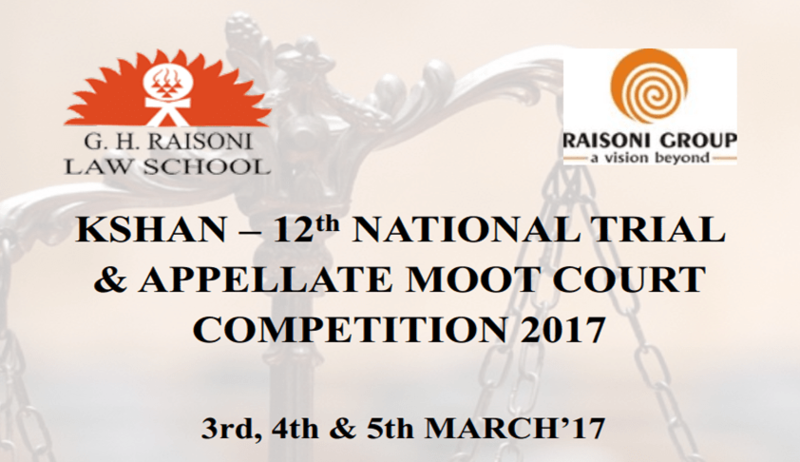 The GH Raisoni Law School, Nagpur is delighted to invite you all to be a part of the National Trial and Appellate Moot Court Competition for the year 2017. The moot is scheduled on 24th to 26th March, 2016. Kshan this time would be conducted on criminal law. The preliminary round would be based on trial advocacy i.e. the teams have to conduct trials, and for the quarters, semi-final round and final round it would be conducted on the basis of judgment passed in the preliminary round i.e. the way moot court competition works. Kshan has been receiving a remarkable response from law teams across the country in its ongoing years. Having successfully hosted 11 Competitions of such magnitude, the institute is looking forward to organize more exciting and enriching experience for all the teams participating in the event. Only 24 teams would be allowed to participate on first come first serve basis, final 24 teams would be decided only after the team has completed all its formalities. The last date of the online registration is 20th February 2017. The soft copy of the registration form along with the soft copy of the DD is to be sent on raisonilawschool@gmail.com . The hard copies of the registration form and DD are to be sent by 22 February 2017. The hard copy of the memorials should reach the Institution on 26th February 2017.